Julia’s Notes Collection Arrives – Petals Fair is about fabric designing, quilting, Christian faith, family and other musings!! In Calgary the fabrics can be purchased at Traditional Pastimes and some of the line will be in at Along Came Quilting. Phone your favorite quilt shops to see if they are carrying it too!! When I try to leave a question it takes me to another screen, this was the only way I could contact you. 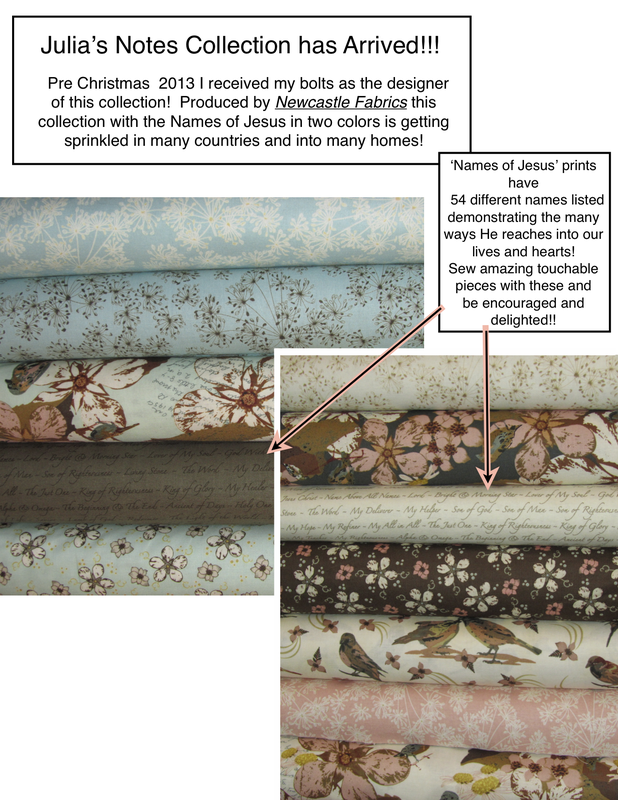 Could you please tell me if the Julias Notes fabric is a reprint or is it actually the fabric from Newcastle by Peggy Brown. If it is I would like to order some, thank you. I was just reviewing comments and reread yours Wendy. I saw you questions and that I had not directly answered them!! The Julia’s Notes fabric is actually the fabric from Newcastle by me Peggy Brown. As you may know Newcastle does not exist anymore and when I have gone on line to find my collection I am not seeing it. If you are interested yet I do have some of every piece of my collection and will sell some for a reasonable price. Sorry my first answer to you missed the point. I have not wanted to compete with shops that would carry my collections. Thank you for your interest!